For 15 years, Margaret Jansen has been a reliable presence at Abria’s North Minneapolis clinic. She can be found there every Tuesday morning, tackling piles of donated clothes, toys, and books. “I like working with the clothes. I like making order out of disorder,” Jansen said. Jansen started volunteering in 2003, when she retired from her nursing career. That year, a friend, who was then the nurse manager of the clinic, invited her to volunteer once a month as a nurse, a post she remained at until her nursing license expired in 2012. Since 2004, she has also been helping in the material assistance program. The order she creates, putting sizes and styles in their correct place and weeding out items that are more than gently used, serves clients who need help providing the basics for their children. Her faith aids clients, too, when she stops her sorting to pray with other volunteers and staff for a woman in a particularly difficult moment. Through her folding and her faith, Jansen lifts up the whole clinic, both clients and staff. 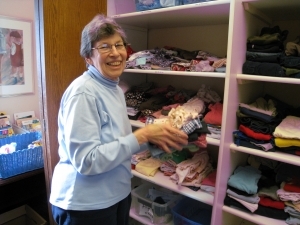 “She is a kind, gentle and delightful soul who, while she quietly and diligently stocks and organizes the clothes closet, radiates warmth and love to those who are blessed to be around her,” Kim Schloesser, material assistance and counseling program manager, said. Jansen sometimes beats the staff to the coffee maker, getting a morning brew going for everyone over some positive chit chat. Jansen has enjoyed volunteering at Abria for two reasons. First, she wants to offer women an alternative to abortion, and second, she loves the people she works with. “Northside is a really comfortable place. Every time I walk in the door I feel comfortable,” she said. 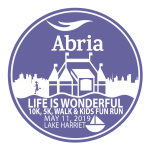 She is part of what makes Abria a welcoming and peaceful place for women in crisis.